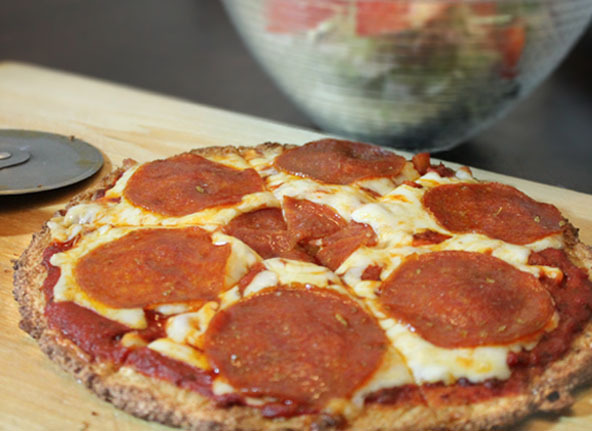 Seriously, this is a good pizza crust recipe and definitely the best cauliflower pizza crust I have ever tasted. I had tried some healthy pizza recipes before and ended up throwing them away. They just didn’t make the cut for me and my family. I didn’t want to even attempt to tweak the recipes to make a better one until I realized that sooner or later it just had to be done. I bucked up and just did it and I’m so glad because now we are hands down in agreement as a family that these are worth making and eating over and over again. I wanted to go with a healthy cauliflower vegetable base and of course gluten-free. But I figured I would need to add just enough almond meal/flour to get it to hold together well but not so much that it would taste grainy. I also used some arrowroot powder to help it make it more crispy. 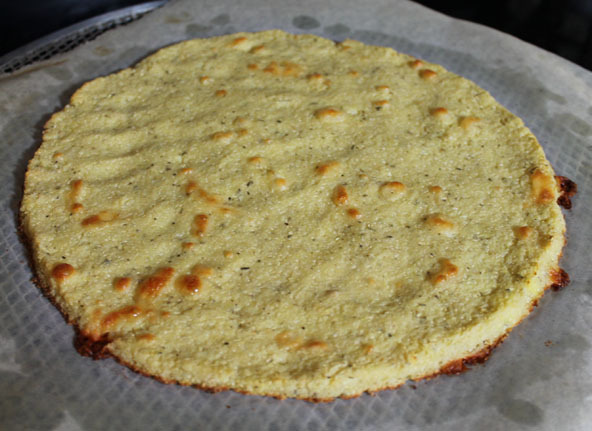 All the recipe reviews for cauliflower pizza crusts I knew of said that they couldn’t make them crispy enough in the middle so they would have to eat it with a fork. They all claimed that they were delicious but quite soggy in the middle. So with some ingredient changes and using a pizza pan with holes in it for ventilation, I was able to find a way to make the crust stiff enough to eat with your hands rather than a fork. All these items are well worth investing in if you are going to make eating healthy a long term lifestyle. Squeezing the liquid out of finely chopped cauliflower “snow” using a milk bag. Please don’t freak out over this step. A milk bag doesn’t cost much and it is well worth it! But you can use a dish cloth if you want. Here the pizza dough is spread out on the oiled parchment paper on the ventilated pizza pan and ready to go in the oven. After the first 20 minutes in the oven and ready to be flipped over and the parchment paper removed to go back in the oven to bake on the other side. Here the crust has been flipped over and the parchment paper has been removed. It was baked again for 10 minutes. Now its ready for the toppings. 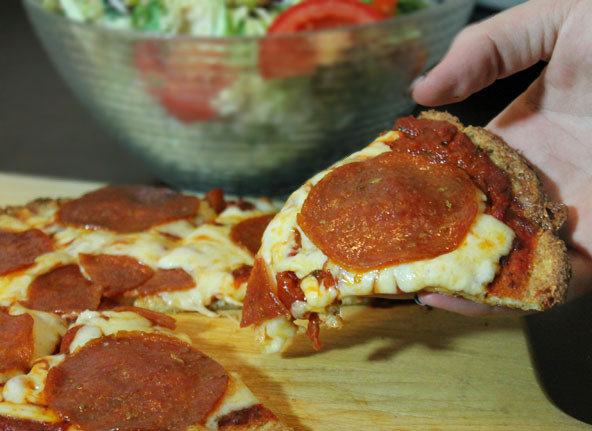 You can make extra pizza crusts to freeze to make pizza making fast and easy next time around. 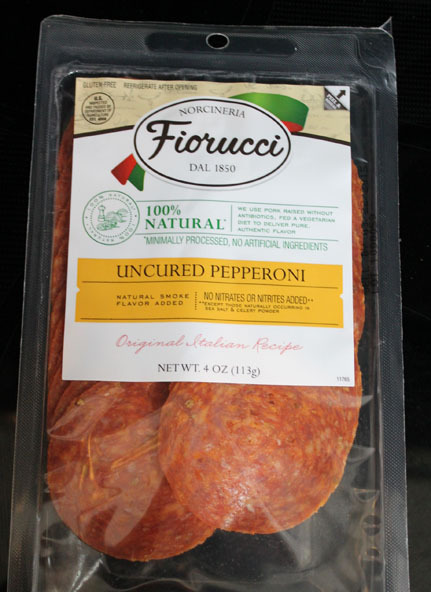 You’re going to have to use a 2 gallon zip-lock bag for the full size pizza or you can make two single size pizzas and place parchment paper between them and freeze in a 1 gallon zip-lock baggie. In a med-large mixing bowl, add an egg and whisk with a fork. Chop cauliflower into chunks and place in a food processor with the cutting blade on the bottom. Blend it until it turns to the size of snow. Don’t blend it pass this point or it will turn into a puree. Place the snow-like cauliflower into a “milk bag” and squeeze out as much liquid as possible. If you don’t have a milk bag then you can use a dishcloth. If you can’t squeeze out any water, you haven’t blended it fine enough. It’s also easier to squeeze out the water in smaller batches. Next, measure 2 cups of packed dry cauliflower along with the remaining ingredients. 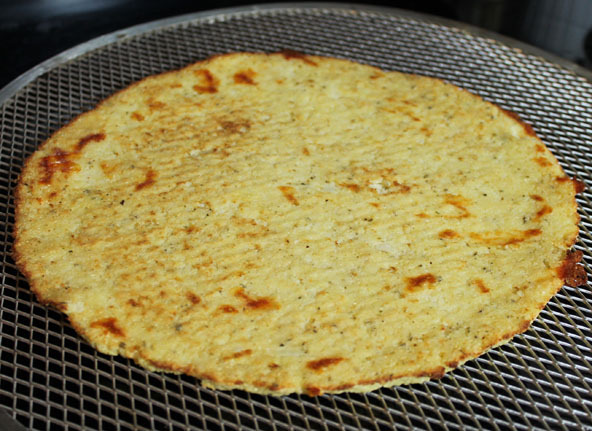 Place parchment paper on a pizza pan that has holes in it. It’s critical that you coat the parchment paper with coconut oil all the way out to the area you are going to spread the pizza out to. If you don’t, the dough will stick to the parchment paper and you will loose half of your pizza crust. 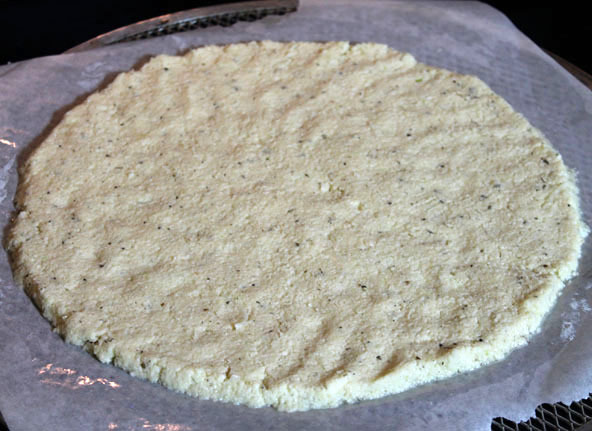 Place the pizza dough mixture out on the oiled parchment paper and spread out the dough and shape with your hands until it is about a ½ inch thick. Place it into the middle rack in the oven and bake at 375 degrees for 20 minutes. Then remove the pizza from the oven and take the parchment paper and flip the crust over on the pizza pan and peel off the parchment paper. Place the pizza back into the oven and bake an additional 10 minutes. Then remove it from the oven. The crust is now ready for your desired pizza toppings. Once the toppings are on, place the pizza back into the oven and bake at 450 degrees for another 6-8 minutes to heat up the toppings. When it’s done remove from the oven and let cool for 5-10 minutes to be able to handle it with your hands.